The Canning Doctor: Springtime, Finally. This winter certainly felt like it went on forever. It's still not all that warm, but at least all the flowers are blooming and the spring greens have emerged. Two days ago I picked a bag full of nettle tips at the farm and today I blanched them and made nettle pasta. After blanching the nettles, I blended them with one egg and set it aside. 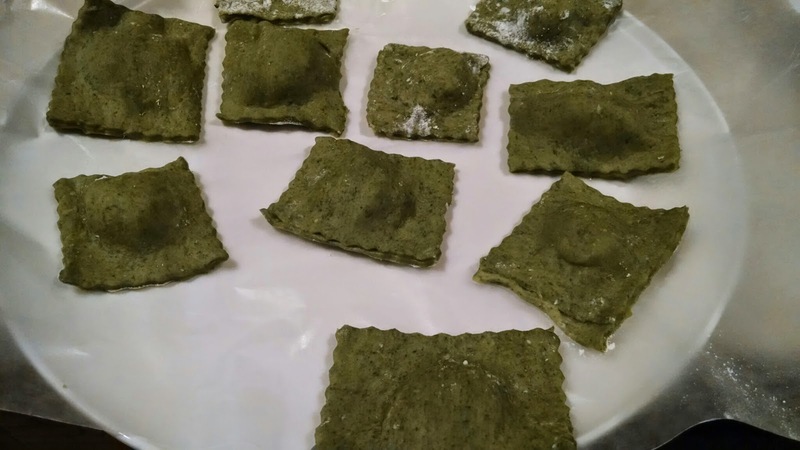 When I was ready, I made the pasta: 1 pound of flour, 3 more eggs, the nettle mixture, and some water. I rolled out the sheets of pasta and put them in a damp tea towel to rest until I made the filling. In the interim, I went to Wolf Meadow Farm and bought some really wonderful ricotta, very fresh mozzarella, and a few other cheeses. I came home ready to make ravioli with mozzarella and ricotta and parmesan filling. Things did not go exactly as planned. First of all, do not store pasta sheets on waxed paper. Just don't. Unless you plan to freeze them. Second, you don't need to use damp tea towels. I think I would have been better off just letting them sit in the fridge and drying out a little. I ended up having to peel the pasta off the waxed paper and rerolling it. There was a lot of cursing but at least most of it was in my head. My first batch of ravioli, the ones for which I attempted to use my press, fell apart, so I put them inside more pasta and made thicker ravioli. Ones that were cut by hand. Which ended up being the right choice. Each raviolo pillow had a small piece of fresh mozzarella plus a little ricotta mixed with parmesan, salt and pepper. We ate just under two dozen for dinner and have about two dozen more in the freezer for later. These were served with a tomato and eggplant sauce I picked up at the farm as well. And, with the leftover pasta dough, I made a little bit of a spaetzle-like pasta. We all had a taste. 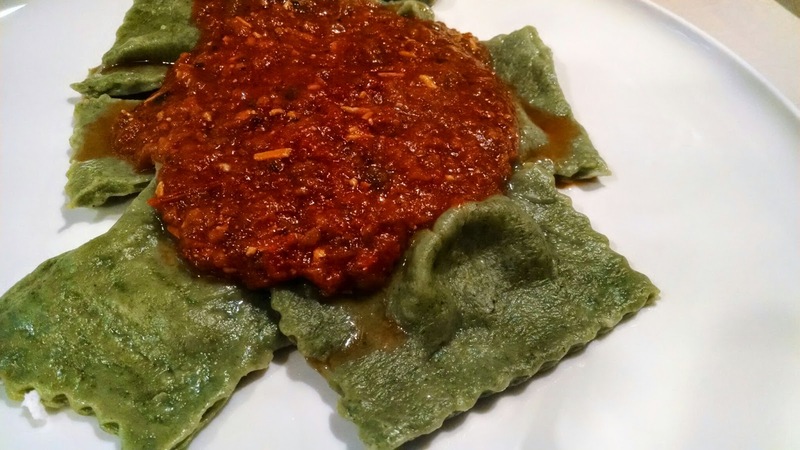 The mozzarella provided a nice stringy melted texture and the ravioli, while a little thick, worked out well in the end.